Attached to your acoustic drums, the DT50 Series professional drum triggers provide accurate triggering while maintaining the natural feel and sustain of your acoustic drums. The sleek chrome finish and durable solid die-cast solid metal body provide a tour level quality with a professional look. 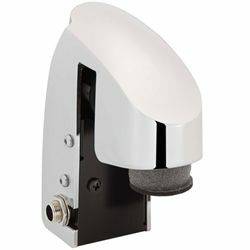 The single-zone bass drum trigger will adapt to wide variety of bass drum hoops.